So, I originally had a fixed screen name for the character to take. The narrator would say that there are randomly generated but the others were silly so MC was forced to go with the only good one. 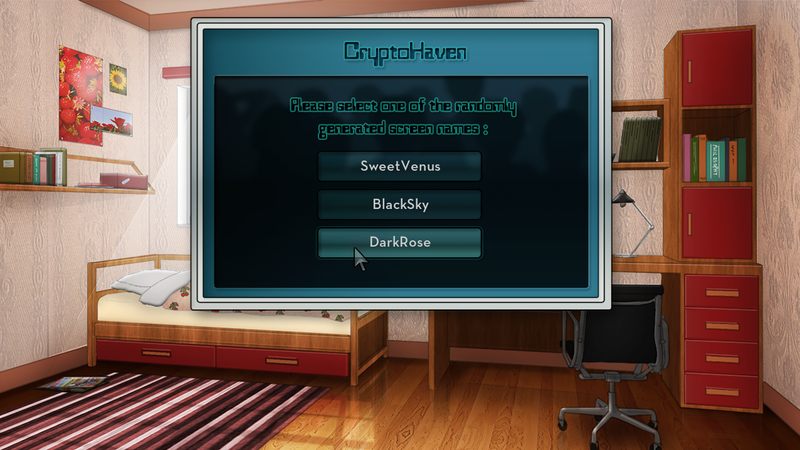 Then I thought, why not actually generate random screen names for the player to choose? I already had a system for it anyway (word1+word2, complicated, I know). So that’s what I did. Using two arrays of words that would more or less work together I generate the names and the players chooses one of three. There are over 2000 combinations. Sometimes the names are silly, but nothing you won’t find online. 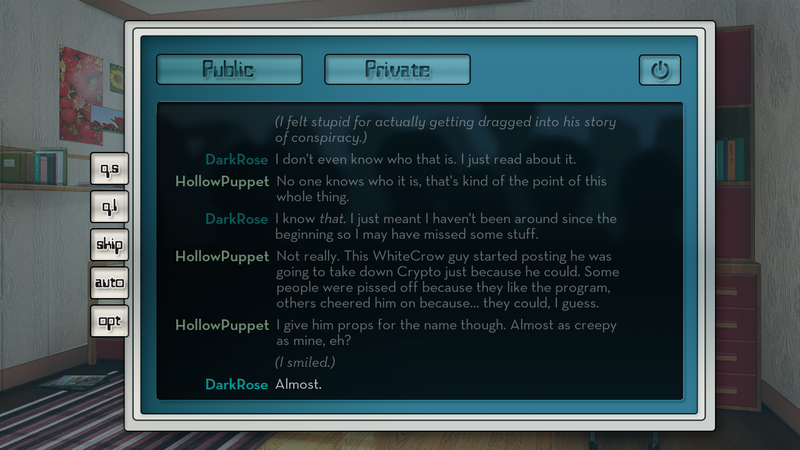 Today I also wrote the first dialogue between MC and Hollow (who is Hollow? let’s just say he’s the antagonist of the story). It’s not set in stone, but I kind of liked the tone of the conversation. I’m still not sure about the coding. I’m doing it NVL style for now (same as with Summer). I think it’s the best way, I just wish I could make the damn thing scroll like a real chat box. I tried using viewport but no dice. Oh well, you win some, you lose some. I’m not sure about the thoughts apearing in the chatbox. There’s no sideimage so I think I need to show some reaction from MC somehow. On the other hand I fear some people might see it as jarring. Arrrgh! What do I do? The game contains 244 screens of dialogue. for an average of 10.7 words per screen. >I’m not sure about the thoughts apearing in the chatbox. Uhm, I don’t like it, to be honest. They are also writing in suspiciously correct sentences, caps and all, for a chat! I don’t really like it that much either, so maybe I can just write at the end how she felt about the whole conversation. In Summer (my other game) I also had some sort of chat program. There they used to write more realistically, but the tone of this game is more serious and it just felt silly to use internet lingo (not to mention it makes the text more difficult to read). I will keep your suggestion in mind, though.